Can you enter an empty room and visualize what it will look like? Most can’t. In fact, over half of us learn through visual aids. This is especially true in real estate. Therefore, I urge sellers to stage their homes to attract the most buyers in the shortest amount of time for the highest sales price. There’s another benefit. A properly staged home will photograph better than an empty home. And, let’s face it, most buyers start their buying process by looking at photographs online before attending a showing. So, rather than moving all of your personal belongings out before listing your home, let’s work together to stage it for quick, top dollar sale. Staging a home simply means preparing and showcasing your home for sale by setting each room up so a buyer immediately can tell the purpose of the room and envision a lifestyle in the home. When done right, it leaves buyers with a warm and comfortable feeling. It’s more than decluttering and redecorating, it’s accentuating the many positive aspects of your house by creating focal points in the main living areas. and that the median dollar amount spent to stage a home is only $675. Bringing in new furniture and accessories is not always needed. Sometimes all you need to do is rearrange furniture and use accessories in a different way. I work with a team of professional stagers who share my goal of preparing your home for quick sale and high price, without unnecessary expenses. Together, we decide how best to stage the home. 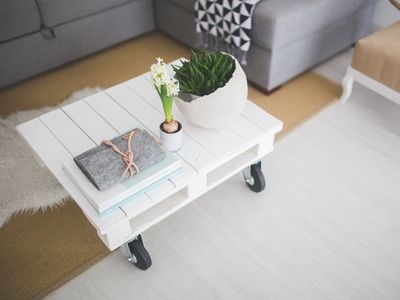 Most know home staging makes the home look more inviting to buyers but you might not know it also help a buyer visualize repurposing of a room. For instance, if a buyer thinks the home has too many rooms, staging can show how a room can be used for a home gym, a media room, a hobby room, home office, etc. Staging can also draw attention away from less than desirable spaces. Maybe the bathroom needs updating but the family room and back yard are staged so attractively that buyers can overlook the bathroom and see themselves enjoying the more appealing family living areas. Or, maybe your home has an oddly shaped or small space. Staging those spaces easily shows a buyer how to maximize these unique spaces rather than have them question paying for that space. Pull out a tall cylindrical glass vase and fill it with brightly colored lemons or limes. Not only does it draw the eye to it, it adds a clean, refreshing smell to your kitchen. Or, fill a glass vase with dried aromatic coffee beans. Place a non-scented votive candle inside. Once again, it leaves an inviting smell in the kitchen. Kitchen soaps and lotions in clear glass look better than the drug store containers they’re are sold in. Consider setting them on a cute tray or elevating them on a vintage cake stand covered with heirloom linen. Make your kitchen or dining table look used by setting it in a stylish, inviting way. Be sure to push all of the chairs next to the kitchen table base to maximize the space around the table. As we’re touring your home before listing it, I develop a vision and a plan of how I will market your home for you. Staging it is a key component of my marketing plan. Time after time, staging nets quicker, better results for buyers. Are you ready to stage your home for sale? Let’s meet and prepare to stage it to minimize the time it spends on the market and maximize the price you get for it. ©Copyright. May 2016. Megan Owens.